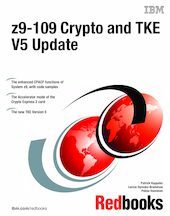 This IBM Redbooks publication provides detailed information on the implementation of hardware cryptography in the new System z9, along with the new version of the Trusted Key Entry (TKE) workstation that is required when a TKE is to manage System z9 cryptographic coprocessors. It also addresses the CKDS sysplex support delivered in ICSF HCR7730, which is not dependent on the use of a System z9. It is expected that the reader is familiar with zSeries hardware cryptography implementation and the purpose and usage of the TKE workstation.